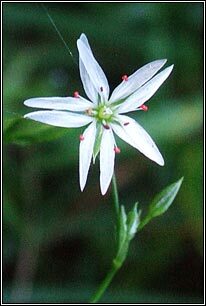 Numerous small white flowers, deep-divided petals. 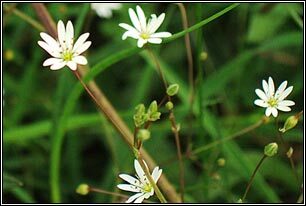 Petals as long or longer than sepals. Drooping stalks when fruiting. Stalkless linear-lanceolate leaves in pairs up stems. Smooth-edged. Weak brittle stems, straggling growth. Height: To 70cm. 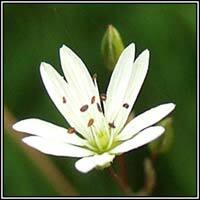 Similar: Bog Stitchwort, S. uliginosa. Wet, often acidic ground. 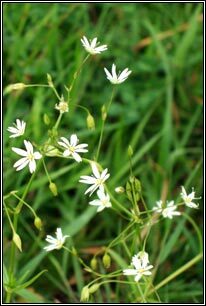 Greater Stitchwort, S. holostea. Larger flowers.